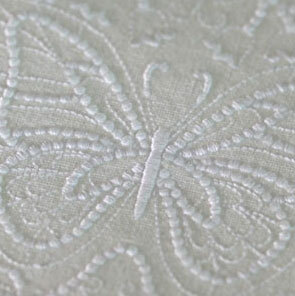 Embrace the beauty of antique linens in your contemporary machine embroidery projects! 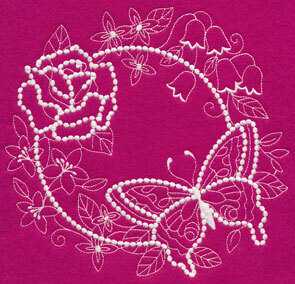 These new designs embody the style and taste of classic embroidery styles, including Jacobean, candlewicking, lace and more. 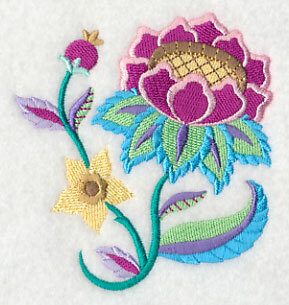 Add a rich and detailed Jacobean flower to quilts and pillows, or adorn a set of tea towels with candlewicking medallions. 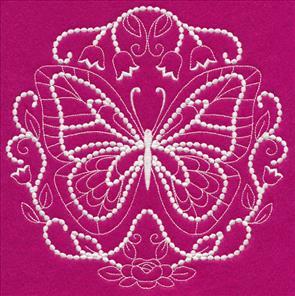 Beautiful butterflies are also new and in the candlewicking style, while graceful birds are ready to land on your next project. 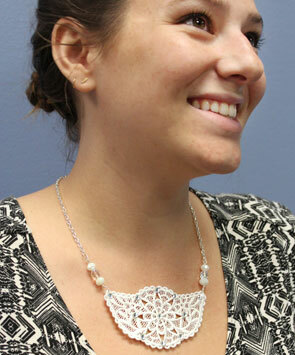 Plus, freestanding lace necklaces will bring a chic elegance to any outfit or wardrobe. 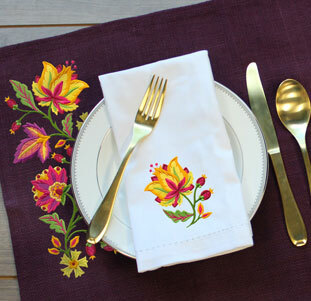 A set of table linens gets a stylish update with classic Jacobean designs. 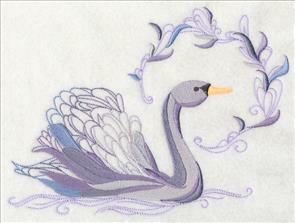 Rich and detailed artwork flourished during the Jacobean era, and these stunning embroidery designs capture that beauty. 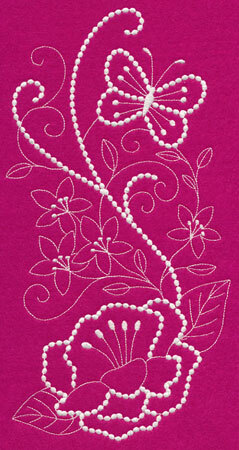 Stylish and graceful, these Jacobean blooms are an eye-catching addition to table linens, pillows, and more. 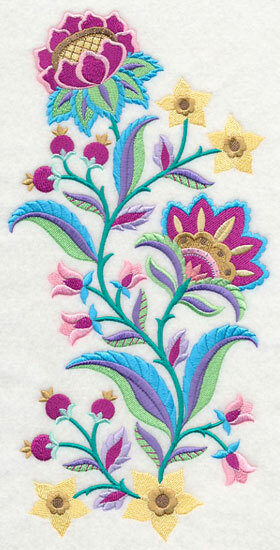 5.43" x 11.75" and 4.34" x 9.40"
These fanciful flowers are filled with wonderful colors and textures. 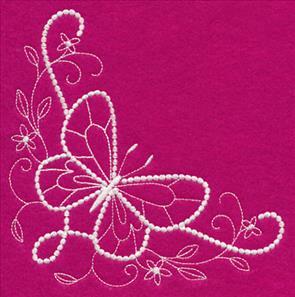 Stitch onto totes, towels, wall hangings, and pillow shams to add brilliant beauty to your home decor. 11.75" x 4.92" and 9.40" x 3.93" and 7.80" x 3.27" and 6.87" x 2.87"
Soft colors give this trio of Jacobean designs a unique, elegant appeal. The shapes and hues are based closely off the traditional tapestries and textiles of artwork from the Jacobean era. 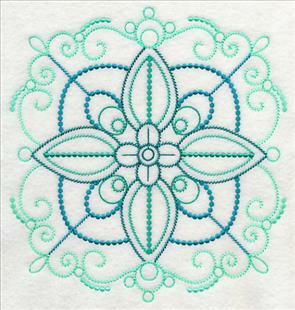 6.02" x 11.74" and 4.81" x 9.40"
A coordinating border makes these flourishing designs the perfect fit on a wide variety of embroidery projects. 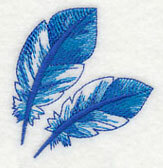 Stitch all three on a set of table linens, or add to bath decor for a sophisticated touch. 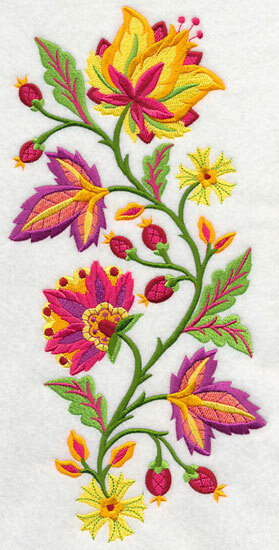 11.75" x 4.65" and 9.40" x 3.72" and 7.80" x 3.09" and 6.86" x 2.72"
The rich and vibrant color schemes found in these floral designs make them the perfect bouquet for quilts and wall hangings. 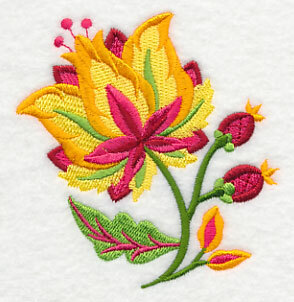 Stitch the fantastic flowers on jeans, purses, or blouses for a fashionable look, too! 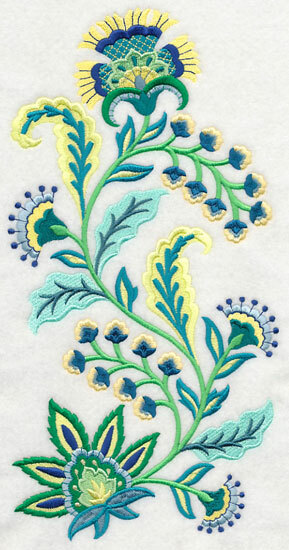 5.74" x 11.72" and 4.59" x 9.38"
The vivid colors and unique layers of depth and texture make these Jacobean designs stand out on pillows, bags, wall hangings, and more embroidery projects. 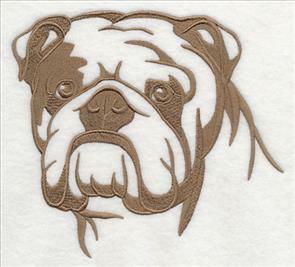 11.70" x 4.68" and 9.38" x 3.76" and 7.79" x 3.12" and 6.85" x 2.74"
Candlewicking began as a hand embroidery style that used thick cotton thread and elaborate knots to add a textured look. 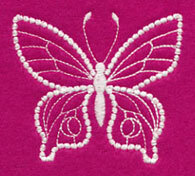 Add the look of candlewicking to your machine embroidery with these fluttering butterfly designs. Learn more about candlewicking in this new video. 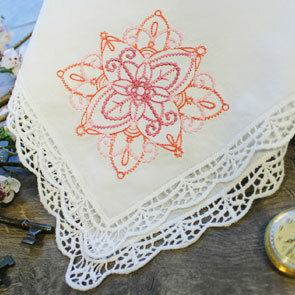 7.80" x 7.73" and 6.91" x 6.85"
5.90" x 5.85" and 4.94" x 4.90"
white tea towel or pillow. 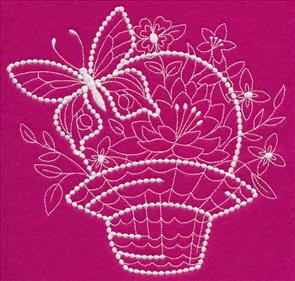 By using 30 weight cotton thread and smooth, satin stitch dots, the candlewicking style can be beautifully echoed in machine embroidery. 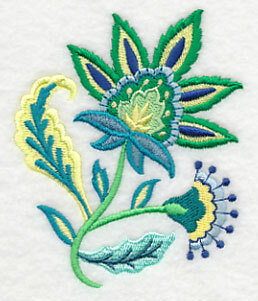 These blooming baskets are a terrific way to add this embroidery style to pillows, bed linens, table linens, and more. 7.80" x 6.87" and 7.16" x 6.31"
6.65" x 5.86" and 5.51" x 4.86"
6.08" x 5.86" and 5.09" x 4.90"
Traditionally, candlewicking was done with thick, cotton thread on white muslin. 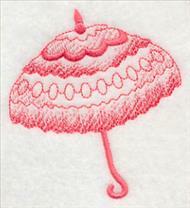 The cotton thread was also used to make hand-dipped candles, and that is how candlewicking got its name. 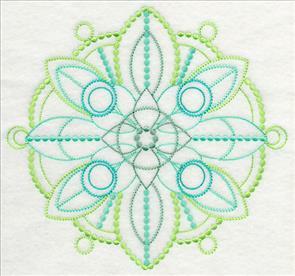 Stitch these contemporary alternatives on pillows, quilts, and wall hangings. 7.80" x 7.31" and 7.26" x 6.80"
6.24" x 5.85" and 5.18" x 4.85"
6.05" x 11.75" and 4.85" x 9.41"
4.02" x 7.81" and 3.53" x 6.86"
In machine embroidery, the traditional candlewicking knots are represented by satin stitch dots. This horizontal spray uses these dots to add texture to the design, while light, vintage-style stitches give an antique look in the background. 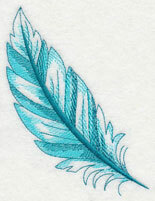 Get more information on candlewicking in this new video, or this written tutorial. 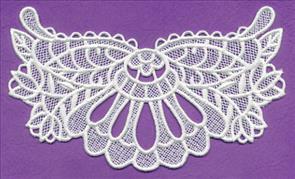 11.73" x 4.50" and 9.39" x 3.60" and 7.80" x 2.99" and 6.86" x 2.62" and 3.88" x 1.47"
The mix of the satin and vintage-style stitches in these designs give them eye-catching levels of depth and texture. 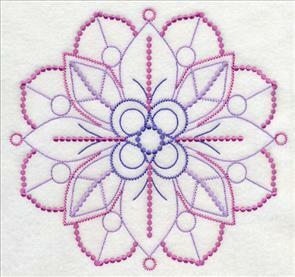 Plus, stitching in only one color means they're delightfully quick, too! 11.75" x 3.51" and 9.41" x 2.81" and 7.81" x 2.34" and 6.00" x 2.05" and 3.88" x 1.33"
Finish off this collection of candlewicking butterfly designs with a corner and accessory. 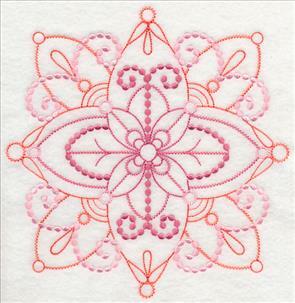 Perfect for pockets, napkins, and more! Get the individual flutterby designs by using the links above, or purchase them all in a design pack! 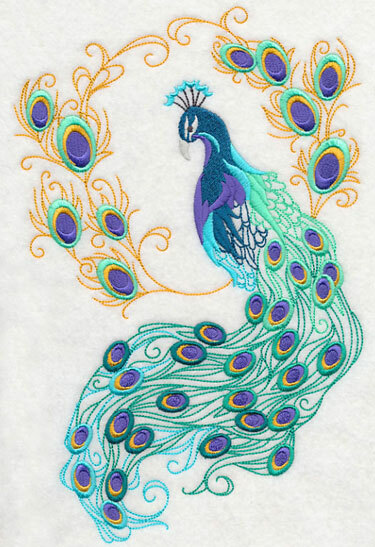 Peacocks are known for their impressive features and elegant allure. 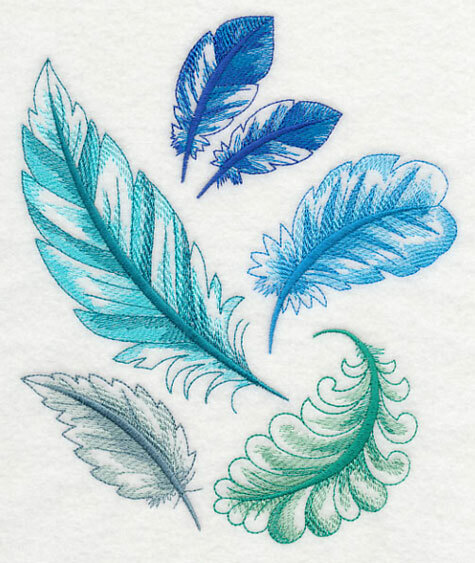 Their feathers of blue and green will stun on tote bags, quilts, bath towels, and more. 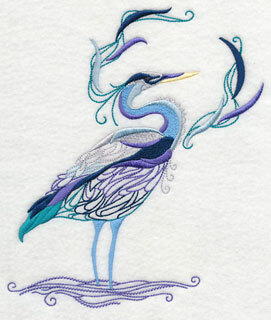 6.90" x 10.36" and 5.85" x 8.78" and 5.20" x 7.81" and 4.57" x 6.86"
A chic heron and majestic swan are graceful and sophisticated accents to pillows, wall hangings, and framed artwork. 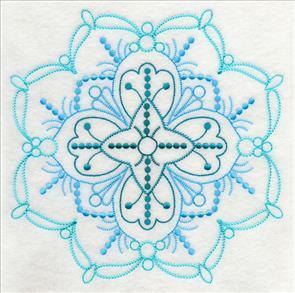 Beautiful for home decor projects! 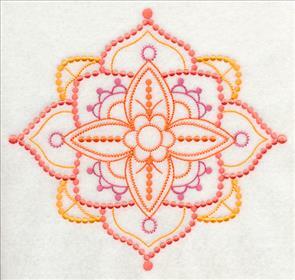 9.45" x 6.83" and 7.82" x 5.66" and 6.75" x 4.89"
Light, vintage stitches combine with the smooth satin dots of candlewicking in these modern and contemporary medallions. 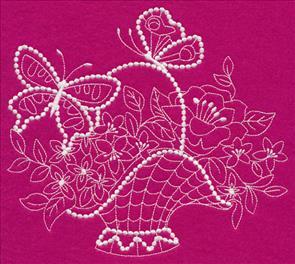 Embroider the mesmerizing designs as a way to combine the best features of machine and hand embroidery. 7.35" x 7.77" and 6.49" x 6.86"
5.52" x 5.83" and 4.58" x 4.83"
7.68" x 7.82" and 6.79" x 6.92"
5.78" x 5.89" and 4.79" x 4.89"
These medallions are gorgeous for dressing up classic embroidery projects, such as handkerchiefs or bed linens. 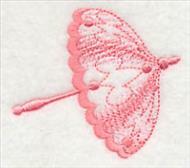 Find more information regarding embroidering on handkerchiefs in this free tutorial, or this helpful YouTube video. Subtle color schemes and kaleidoscope-inspired patterns give these designs a dazzling effect. 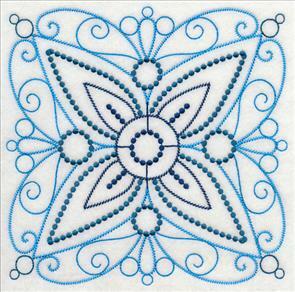 Stitch on quilt blocks, pillows, or tea towels! 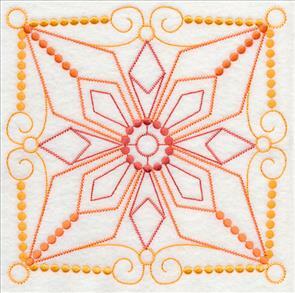 7.65" x 7.76" and 6.81" x 6.91"
5.81" x 5.90" and 4.77" x 4.83"
Pick your favorite medallion to stitch along, or use a handful on your next project. 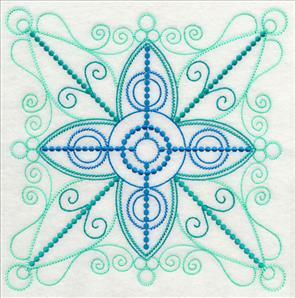 Stitch one on either side of a tote bag, use three in a series of framed art, or add them all to a quilt -- the opportunities are endless! 7.81" x 7.80" and 6.90" x 6.89"
7.83" x 7.73" and 6.95" x 6.87"
5.91" x 5.84" and 4.91" x 4.85"
Because these designs feature open areas where the fabric shines through, solid, neutral fabrics are excellent choices to stitch on. 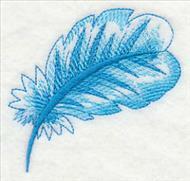 Examples include denim, linen, tea towels, canvas, or quilter's cotton. 7.82" x 7.34" and 7.33" x 6.87"
6.27" x 5.88" and 5.19" x 4.87"
7.78" x 7.75" and 6.90" x 6.86"
The gorgeous, elaborate detail and coordinating colors make these medallions the perfect choice for home decor projects. 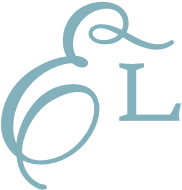 Adorn aprons, lightweight scarves, and more with the impressive designs. 7.65" x 7.78" and 6.75" x 6.86"
5.73" x 5.83" and 4.78" x 4.86"
7.80" x 7.27" and 7.28" x 6.79"
6.26" x 5.85" and 5.17" x 4.84"
Each of the medallions embody the splendor and grace of antique linens, while embracing the contemporary style. 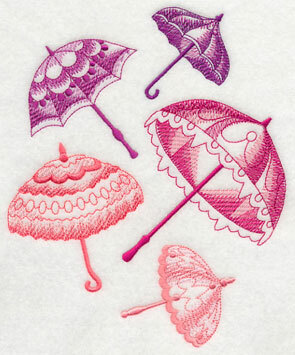 Add to tea towels, apparel, blankets, and so much more! 7.81" x 7.20" and 7.33" x 6.76"
6.31" x 5.82" and 5.23" x 4.82"
7.80" x 7.27" and 7.29" x 6.80"
Stunning detail and whimsical color gives these medallions a distinct look. Add them to your basket by using the links above. Or, get all 12 in a design pack. Hot air balloons float through the sky in this quick-stitching collage. 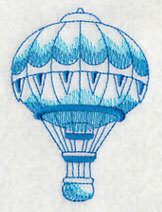 Light stitches and fanciful details give each of the balloons a whimsical feel. 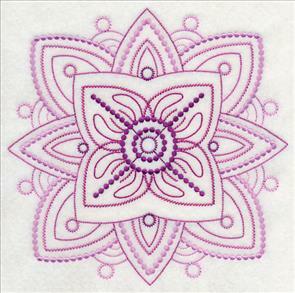 Great for pillows, totes, and more! 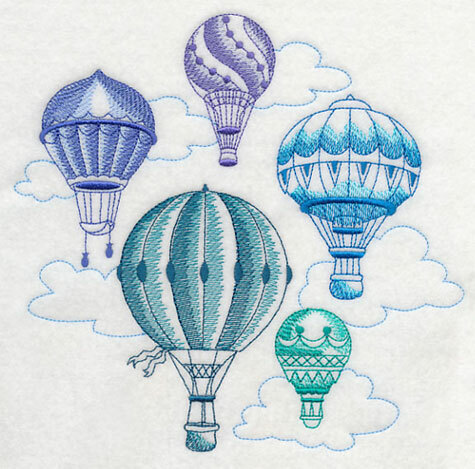 7.80" x 7.42" and 7.24" x 6.90" and 6.14" x 5.85" and 5.07" x 4.84"
Each of the hot air balloons are stitched in a different shade of the same color family -- and they're available for individual purchase, too! Pick your favorite, or stitch them all. 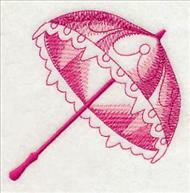 2.45" x 3.48" and 1.60" x 2.27"
1.29" x 2.03" and 0.84" x 1.32"
Pretty pink parasols evoke the style and beauty of the Victorian era. 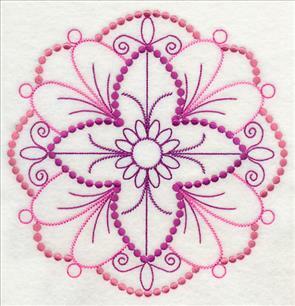 Add the light and airy collage to embroidery projects, including wall hangings, makeup bags, and T-shirts. 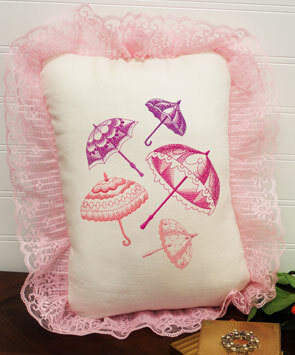 6.41" x 7.80" and 5.85" x 7.13" and 4.84" x 5.89"
A lovely lacy pillow is the perfect place for this collage to shine. 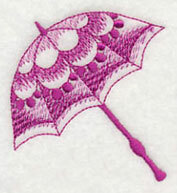 Each of the parasols are sold separately, and will add a chic look to pockets, totes, and more! 3.67" x 3.90" and 2.78" x 2.94"
2.58" x 2.30" and 1.95" x 1.74"
A cascade of fancy feathers give this lovely collage eye-catching appeal. 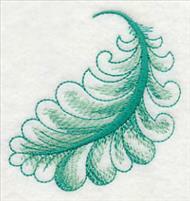 A great choice for embroidering on framed art, quilts, and tea towels. 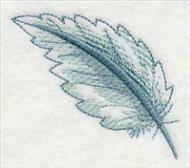 6.57" x 7.81" and 5.86" x 6.96" and 4.86" x 5.77"
Use the feather separations in conjunction with the collage above, or stitch singly on your next project. 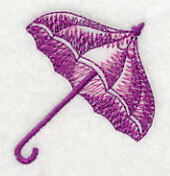 Fantastic on apparel, such as blouses, vests, or pants pockets. 3.07" x 3.16" and 2.27" x 2.34"
2.68" x 2.40" and 1.98" x 1.78"
Add a gorgeous look to your wardrobe with freestanding lace necklaces. Simply add a chain to each lace piece to transform it into a gorgeous accessory. See how these fashionable necklaces are assembled in this free tutorial. 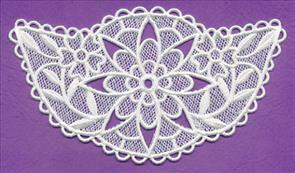 6.89" x 3.93" and 5.29" x 3.03" and 3.89" x 2.24"
Crystals, beads, and other accents give these lace pieces even more pizzazz. 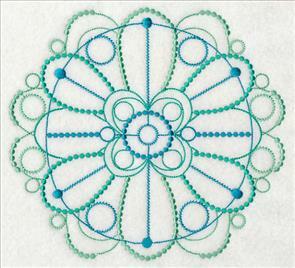 Plus, a variety of sizes allows you to make the perfect necklace for any outfit. 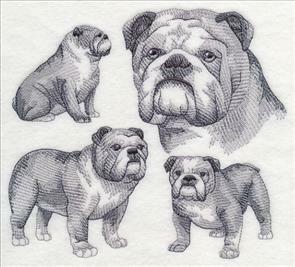 6.89" x 3.17" and 5.28" x 2.44" and 3.88" x 1.79"
Charlotte (and many other bulldog lovers!) requested a sketch and silhouette design featuring the adorable dog breed. She raises and shows English bulldogs. Thanks for the suggestion! 7.69" x 6.90" and 6.52" x 5.85" and 5.40" x 4.85"